Sainte-Maxime. Rent studio 4 persons in a quiet charm. 200m range. You will have a real kitchen with a large fridge / freezer, gas stove with 4 burners, an oven. A bathroom / shower with corner bath welcome you after the beach. You can bask in the sun loungers on one of the 2 terraces. Eine perfekt eingerichtete, kleine Wohnung mit viel Liebe zum Detail, ermöglichte uns, bei wunderbarem Wetter mit Strandspaziergängen und Ausflügen eine herrliche Woche zu geniessen. Die Vermieter sind sehr freundlich und die Ausstattung funktioniert vom Toaster bis zum Staubsauger. Waren zu zweit Anfang Oktober in dieser netten kleinen, gut ausgestatteten, zentral aber dennoch ruhig gelegenen Wohnung. Würde diese Unterkunft bedenkenlos weiterempfehlen. Einzig zum nächsten Supermarkt ist ein Auto von Vorteil. Vielen Dank auch an den netten Vermieter. Appart sympa avec bonne "ambiance marine'"
le couchage sur la mezzanine demande un peu d'attention pour ne pas se cogner mais , c'est très confortable et calme. Merci pour votre gentille appréciation, effectivement la mezzanine est un peu basse par endroit. It was a very lovely and cosy studio! 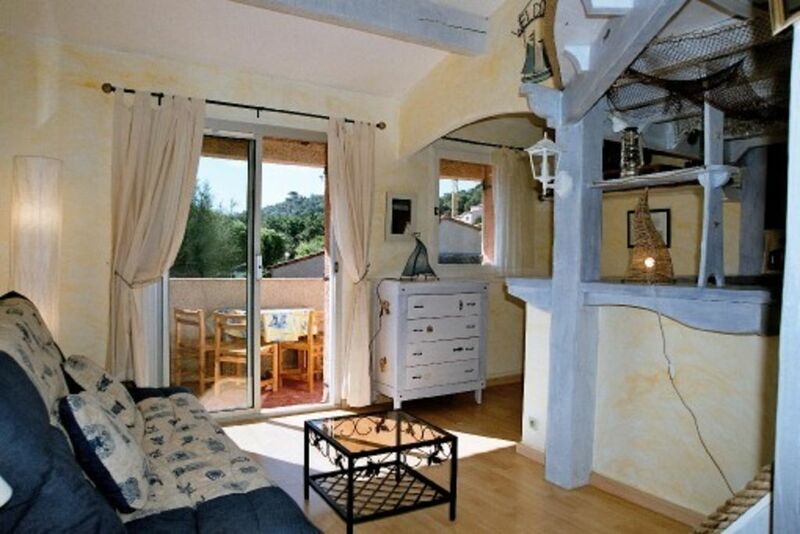 Near to the beach and St. Maxime. We had everything we need at the studio. The communication with Thierry was very fast and good. We could travel around because there is the bus route St. Rafael to St. Tropez. The only thing which was bad -has nothing to do with the accomodation or Thierry! !- was the pizzaria "Mama Mia" in St. Maxime. After our dinner in this restaurant my son got really sick. A flat where we (family 2+2) found EVERYTHING we needed. Very pleasant, easy and nice contact. Wonderful beach "in the neighbourhood". In summary: great two weeks.